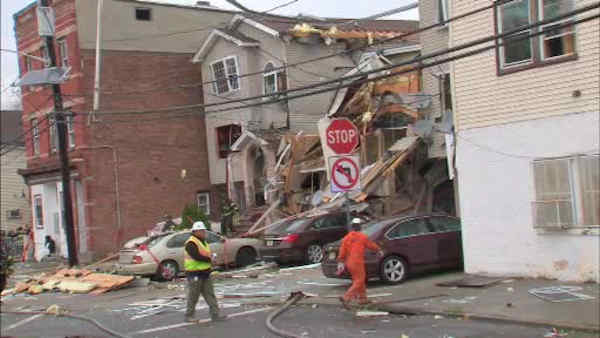 ELIZABETH, N.J. (WABC) -- Two more victims in the explosion that destroyed a house in Elizabeth, New Jersey, in November have died from their injuries. City Spokesperson Kelly Vence confirms that 11-year-old Tyquan Henderson passed away Tuesday, while 36-year-old Tavasha Henderson passed in the beginning of January. Kimayha Henderson, 26, died in early December from injuries she sustained in the November 11 blast that killed 24-year-old Femi Brown and left more than a dozen people injured. Elizabeth Mayor Chris Bollwage says an apartment behind the garage was illegally receiving gas and electric and that investigators believe a gas line that wasn't properly capped after a dryer was removed from the property caused the blast. Bollwage says some residents told investigators that they smelled gas the day before the explosion and told the owner, but that the owner has denied this. The explosion happened at 8 a.m. on Magnolia Avenue between Catherine Street and the Route 1 overpass in Elizabeth. Bollwage reinforced that that this definitely was not a carbon monoxide or propane episode, but a natural gas incident. The explosion demolished the two houses on either side of the home. All three houses were new construction. Emergency responders immediately after the blast started combing through the rubble, where they rescued several of the victims. The building was searched with no other victims located. Rescuers used dogs to search the debris further. Seven surrounding buildings were impacted, but those occupants were uninjured, officials said. At least two buildings will be demolished.